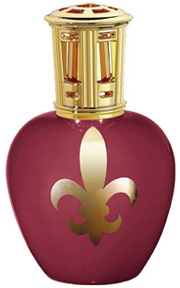 This beautiful Lampe Berger lamp exhibits the French royal fleur de lys as a sheet of gold hand applied to the medium burgundy background. It is furnished with a nice Lampe Berger gift box with a burner, funnel and instructions. This lamp is now retired by Lampe Berger.